Federal law requires farm employers who pay cash wages of $20,000 or more in a quarter, or who employed 10 or more workers in 20 different weeks during the year, to participate in unemployment insurance. An estimated 88 percent of the average 1.3 million hired farm workers were covered in 2008, including an average 536,000 workers employed on crop farms, 227,000 in animal production, and 291,000 by crop support employers such as labor contractors. 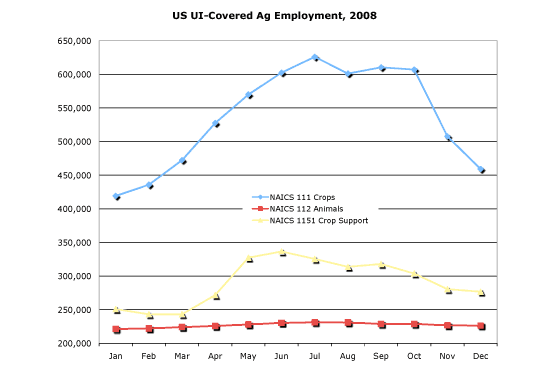 Employment peaked at almost a million in crop production and crop support services. If each year-round equivalent job slot was filled by two workers during 2008, there were almost two million workers employed on crop farms.